A bit shy to write those words considering how long I was gone. To be honest, it is difficult to explain why I have been away from the blog for such a while. As you may know (I really HOPE you do know ^^) I have published a book (that you can buy from me here). It was published last may. And… it kind of sucked all my writing energy . After it, returning back to the blog felt so hard. I had lost the “good habits” to publish once a week. And everyone seemed to be on instagram. And I do not like instagram so much but hey, so easy right? Are there still people reading blogs now in soon to be 2019 I wondered? Also, to be honest, I make almost no money here. My incomes come from my clients. So I postponed and postponed. I received messages asking me when I would post again and if I will. So there I am, facing a blank web page. Or a “white page” as you say in french. To start again I therefore chose a white topic: the white pants. Hope you’ll enjoy it. Looking forward to read you again in the comments section. 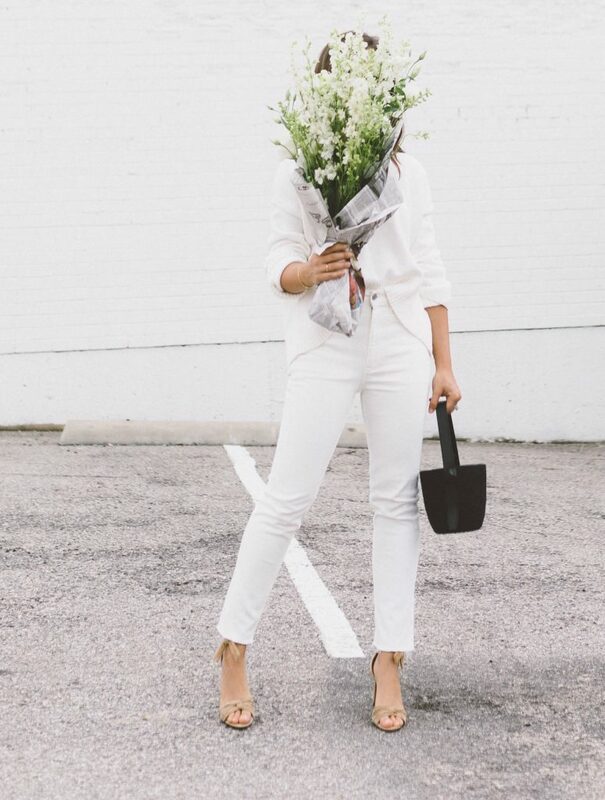 White pants are a great autumn wardrobe staple. They come off as french and unexpected (even if seen everywhere this year. Well at least in Paris). They confer softness and light to the usual autumnal palette. And if they may get dirty, there are no fragile item. A little mud stain may be part of the deal, no one will resent you. They can range from crisp white to off-white. If you choose them with quite a stiff fabric, they won’t have any transparency to them and resist rain and wind. You may wear them skinny, straight or slightly flared. Eventually add a belt to structure the top of them. Black, navy blue, brown, beige, kaki, gold, snake, leopard, burgundy, dark green, your belting options are endless. I am talking tailored pants, cigarette or carrot shape. 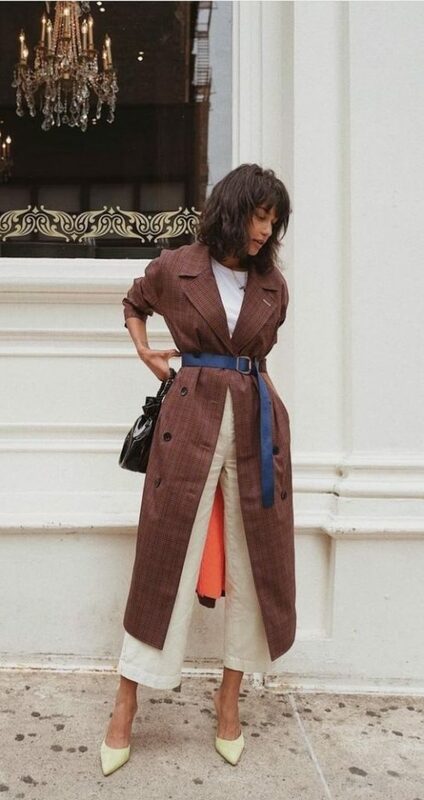 Again, you could add a belt to structure the upper part of the pants. You can choose this belt with a dressier leather (smooth or shiny). II/ What colors and prints to wear with? 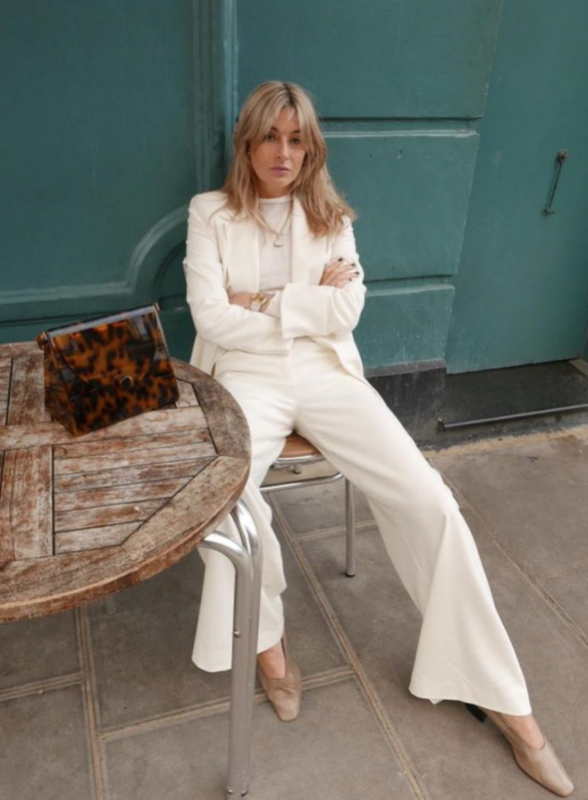 Having already written an article on how to wear white jeans quite a while ago, I will focuss on an autumnal take on this question. I love to mix white with other shades of it, warm neutrals or warm shades as well as with dark colors. As for prints, I think animal ones are its best mates. Along with warm colored tartans! You can also do a transitioning print trick by choosing a print that contains some white. 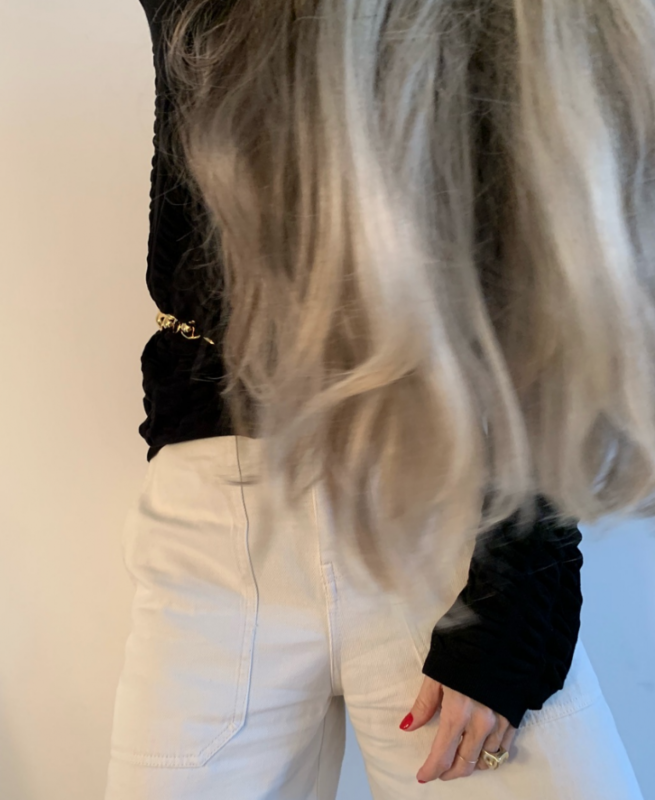 Just as I described on my articles on how to wear head to toe black or colors monochromes, when you are doing all over white, try to use different fabrics and textures. You can liven up the outfits by adding some jewels, either delicate or statement. 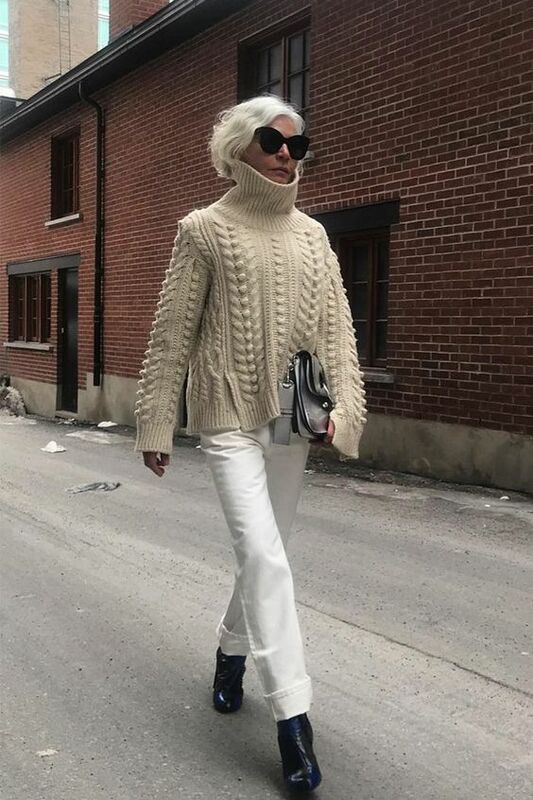 Unknown stylish lady sporting a beige textured oversize knit along with another shade of white on her own head. 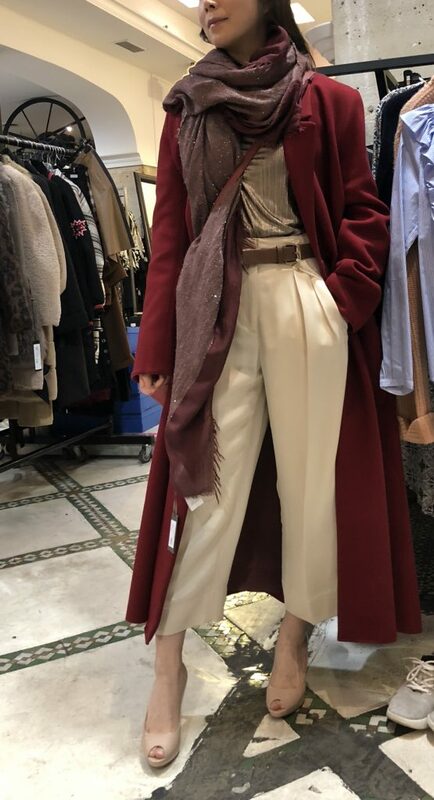 Ranging from warm neutrals such as beige and camel to autumnal burgundy reds and mustard yellows. On the Polder lookbook from a few years ago the model is radiant with a mustard yellow sweater paired with white chinos. The almost black green belt adds some structure to the look by creating a dark color punctuation between the top and the bottom. The softness of green shades always blends nicely with the whites. 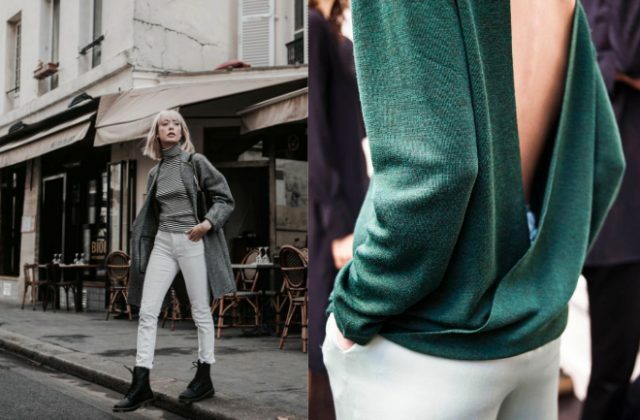 Irina Linovitch, spotted by Style du monde is wearing a blend of natural shades including kaki green. A hint of red snake boots making the whole look pop. I.e colors that are not too saturated. Like they have a bit of white or grey to them. 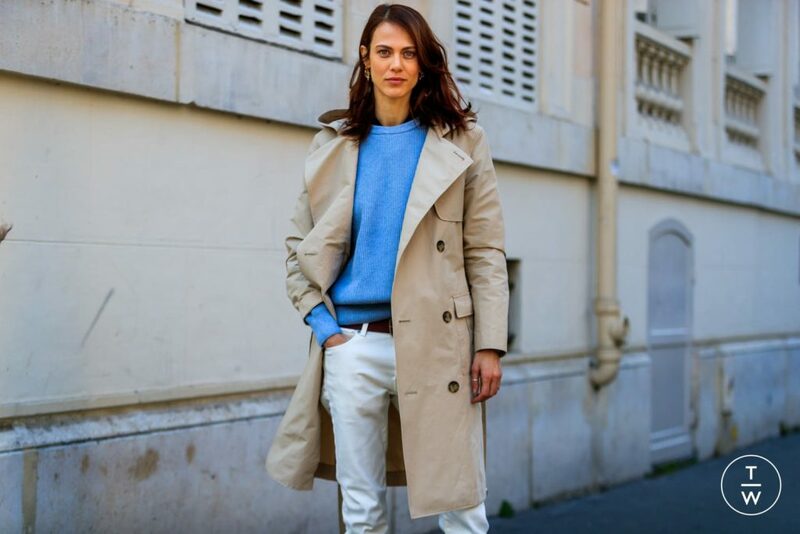 Here Aymeline Valade, probably the most stylish girl in France, spotted by @thefrenchystyle on Tagwalk, wears a mild blue sweater surrounded by off-white, beige and brown along with a pop of gold on the ear lobe. Navy blue and white have a typical sailor vibe that is perfectly appropriate for winter layering (what if there is a storm huh?). 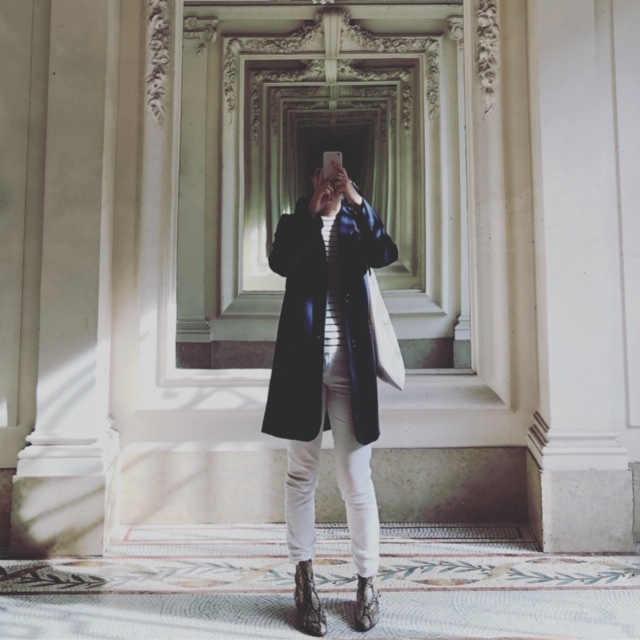 I, mixing navy blue coat, breton top and snake cowgirl boots with my white levis (Midwest meets Bretagne that is the spirit). White on black may look waitressy, but good news, black on white does not. Sophie Fontanel sophisticating her black and white workwear outfit with some gold accessories and perfect poppy red mani. And showing off her grey crown of glory. Those animal prints have a warm autumnal feel to them. In my opinion the white liven up the otherwise conventional cosiness or sexyness they usually convey. Snake shoes and dark colors on this look captured by Collage vintage. The plaid feels like you could hang out by the fire and fall asleep on the cat’s lap (or opposite). White will give you some energy to go through the work’s day without a nap. What I call a transitioning print is a print that contains one of the colors of the piece it is matched with, allowing a nice blend into the outfit. See Jeanne Damas blending the white flowers of her black top into her high waisted white jeans. III/ What occasion are they for? I recently heard the “no white after labor day” american mantra from a client. There is no such thing in France and I am happy to go to parties with my white Valentino top or with a white T-shirt. I think I would with my white jeans too eventually. Pairing them with maybe a frilly top. (EDIT: apparently the rule is “no white after Labor day capital L, which means no white after the first week of september. Which does make sense. I’ll keep my paragraph on white at night nonetheless. Extensive info there). I soooo regret I can’t create outfits on Poylvore anymore (polyvore being very much dead, how do I do collage without spending hours on them now? Taking any tips, merci.). 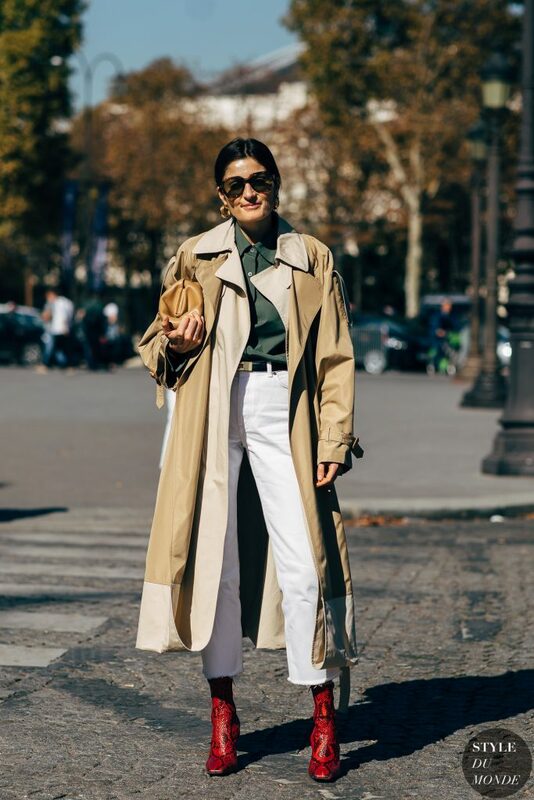 Daytime use is quite obvious as we have just seen above, white pants may be work both for casual and workwear.